(Bill Greene/Globe Staff/File) The grist mill on Stony Brook Road stands on its original 1663 site and uses the force of the water from several ponds to grind fresh cornmeal on Saturdays in the summer. Down the road at the Brewster Ladies’ Library readers in comfy armchairs thumb through newspapers as if they are sitting in a Victorian study. Around the bend, patrons sun themselves on the benches in front of the bunting-draped Brewster Store, which sells penny candy, homemade fudge and taffy, and has a functioning nickelodeon. Next to the ancient herring run the water-powered grist mill still grinds corn as it did in 1873. You don’t need a time machine to dial yourself back a century or three in this throwback town on the north side of Cape Cod between Dennis and Orleans. What Henry David Thoreau termed “the modern-built town of the Cape’’ when he passed through around 1850 retains most of the well-to-do charm that dates to when prosperous mariners lived in mansions along old King’s Highway. “America’s Sea Captains’ Town’’ is what the Chamber of Commerce calls it and their salty legacy endures. Many of their homes along Main Street (Route 6A) have been transformed into cozy inns and bed-and-breakfasts: Isaiah Clark House, Old Manse Inn, Pepper House Inn, Candleberry Inn, Bramble Inn. The town-run golf course is named Captains and each hole along its adjacent “port’’ and “starboard’’ layouts is named after former seafarers like Benjamin Berry, Isaac Weatherbee, Enos Godfrey, Elkanah Winslow, and Freeman Bangs. Some of those captains probably dropped in at the Brewster Store, which was built as a church in 1852 but has been selling general merchandise since 1866. In addition to candy, coffee, pastries, and hot roasted peanuts, the store, which features a coal-burning stove in winter, is chock-a-block with myriad necessities like spare lamp parts, bayberry candles, soaps, dishcloths, and Mrs. Stewart’s Liquid Bluing, a laundry whitener. Upstairs is a roomy space filled with nostalgic items like World War I and II posters for sale. If the store serves as the town’s pantry and the Brewster Historical Society its heirloom-crammed attic, the Ladies’ Library is its front parlor. Though the building has been renovated and expanded, the front two rooms that overlook Main Street come right out of 1853, when the library was founded. Besides the fireplaces, carved wooden chairs, framed portraits, potted plants, and grandfather clock, there’s the elaborate dollhouse that Captain Josiah Knowles built for his daughter Nellie around 1860. Brewster may be the antiques capital of the Cape, with more than a dozen shops strung out on Route 6A along with art galleries and pottery makers. If the bygone days are inescapable in the town named for Elder Brewster, the Mayflower’s grand old man, it’s because most of its buildings and artifacts seem still to be in use. 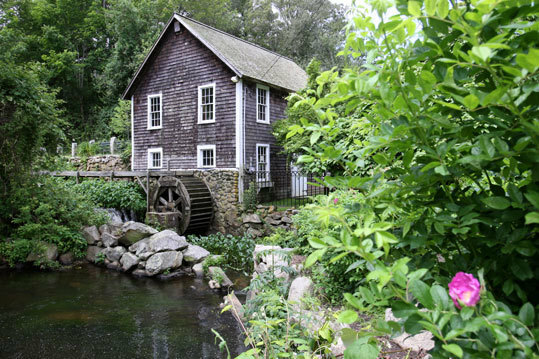 The grist mill on Stony Brook Road sits on the original 1663 site and its wooden wheel uses the down-rushing water from the ponds out back to run the machinery that turns out brimming bags of fresh cornmeal on summer Saturdays. The ponds are the destination for the hundreds of thousands of river herring that return from the ocean during the spring to spawn in fresh water before returning to the Atlantic Ocean. If they’re fortunate, the fish survive a murder er’s row of seagulls perched greedily along the mile-and-a-half-long run up from Cape Cod Bay and get to lay millions of eggs before dodging the gulls again on the way back down. During the run, which usually goes from mid-April to mid-May, both townspeople and tourists turn up to watch the herring leap their way up along the fish ladder while a volunteer from the Alewife Committee stands nearby to keep away both gulls and scofflaw fishermen (it’s illegal to catch the herring). Paine’s Creek, where the herring enter and exit, leads to one of the town’s seven beaches, which extend all the way to where the Cape’s inside elbow turns upward to Provincetown. The bay is where Brewster once made its living from packet boats bound for Boston and from saltworks along the shore. But unless you turn off Route 6A onto one of the roads leading to the water, you wouldn’t know that this is a shoreside town whose eight miles of beach offer an expansive panorama and technicolored sunsets. The famous Brewster flats, the widest in North America, are a squishy nirvana for waders and tidepoolers who can walk out more than a mile at low tide among the clams and crabs while beachcombers scoop up a cornucopia of shells and stones to bring home. Sometimes it takes a bit of poking about to turn up some of the town’s attractions, like its restaurants. Chillingsworth, the gourmand’s delight on the grounds of a 300-year-old estate, and the Brewster Fish House are situated prominently along King’s Highway. But Peddler’s Bistro, which plates French fare like escargots, duck a l’orange, and steak au poivre along with gently-priced wines, is tucked away on Thad Ellis Road. And El Guapo’s Taqueria, which serves up fish tacos made from local cod, is down along Underpass Road next to the bicycle trail and across the way from the Stony Brook Elementary School where the Brewster Whitecaps, who perform in the 125-year-old Cape Cod Baseball League, still play their home games in daylight. If the Whitecaps wanted to, they could lay out a diamond on the enormous acreage at Drummer Boy Park on the town’s western edge, where summer concerts are held on Sunday evenings at the old wooden bandstand. Drummer Boy has become a theme park for 18th- and 19th-century structures that have been uprooted, restored, and moved there from elsewhere in town. The Harris-Black House, which once accommodated a family of 13 in a single room, is a post-and-beam Cape classic. The Higgins Farm Windmill, with its enormous wheel, still works. So does the blacksmith shop, which was built in 1867 by Henry Hopkins and moved to the park last year along with its original chimney and forge. Hanging from the doors opening outward is a variety of fireplace and garden tools that give a 19th-century style to 21st-century tasks. “You name it, we can make it,’’ says Hirst, an Orleans resident who also has his own biochar business. The village smithy still works by daylight, no electricity needed. “We’re totally off the grid,’’ says Hirst. Come autumn, when dusk arrives early, he’ll light an oil lamp. In Elder Brewster’s modern-built town, old-school is still as good as new. Sea captain’s home built in 1785. Deck overlooks gardens. From $149. Sea captain’s manor built in 1801. Terraced gardens. Living room has library and grand piano. From $145. Georgian-style captain’s home built in 1790 with two acres of lawns and gardens. From $135. Set on six acres of lawns and gardens on 300-year-old estate. Seven-course table d’hote menu ($60-$75) includes truffled “mac & cheese’’ appetizer, grilled duck breast, seared scallops, roast beef tenderloin. Bistro menu ($17-$32.50) available in greenhouse. Sunday brunch and special monthly dinners. Cozy and candlelit hideaway run by French chef and his wife offers classic Parisian bistro fare: escargots, mussels, duck a l’orange, steak au poivre. Closed Sunday. Thu-Sat after Labor Day. Appetizers from $11, entrees from $24. Nachos, Mexican street corn, fish tacos, enchiladas, fajitas, burgers. Beer, wine, Mexican sodas. Convenient for families. Outdoor tables and takeout orders. From $4.50-$12.95. Blacksmith shop, windmill, and 18th-century Harris-Black house open from 1-4 p.m. Thu-Sat. Sunday evening band concerts July and August. Nineteenth-century mill next to herring run grinds corn for sale from 10 a.m.-2 p.m. Sat-Sun June through August. Paine’s Creek is the best of the town’s seven bayside beaches at low tide. Parking $15 in summer; stickers available at Town Hall visitors center at 2198 Main St.